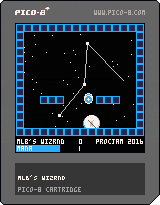 WIZRND, a PICO-8 entry to #ProcJam2016. The main idea behind this project was to learn about developing for the PICO-8 platform -- although I have some programming experience, I've never made a game before. My goals were to simply make anything that was remotely playable, which actually didn't take that long. 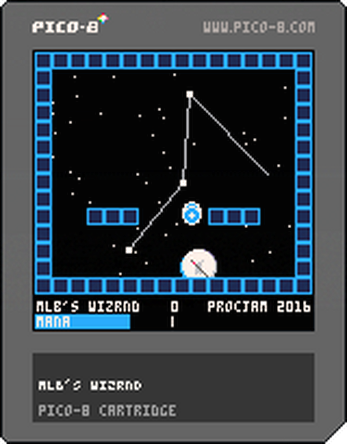 Since I'm interested in procedural generation anyway and didn't have a lot of spare time to make a game in, contributing to #ProcJam was the perfect excuse for me to actually learn how PICO-8 works. Turns out, it's super fun and very straightforward. The source is available freely on github. There's also a thread on the lexaloffle games bbs here. That zooming fireball is a cruel mistress! Last thought for the day... it could be cool if the blue glowy balls had eyes, or some sort of indication that they were creatures, because they do track your position, making it feel like they are sentient in some way. It could be cute if they looked like some sort of little creatures, or demons, or something. Yeah! The magic missile is a little vestigial -- lightning and the shield are where it's at. It'd be rad if the positioning of the platforms was randomised each time you play!